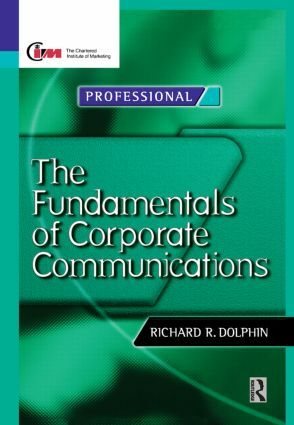 The Fundamentals of Corporate Communications gives professionals and students in marketing a comprehensive and incisive overview of what modern corporate communications is, and what it can achieve. The author has drawn on extensive business experience in the area and wide ranging research in major corporations to produce an authoritative account of best practice - backed by numerous cases and examples. The book is both highly practical, it is grounded in real business issues, and rigorous in covering the concepts accessibly. It will be an essential text and reference for practitioners and students of marketing. Richard Dolphin has brought an unencumbered mind to a thoroughly researched, comprehensive review of corporate communication practice. The conclusions are soundly based and workmanlike, cutting through much of the pretentious noise which often surrounds the subject. Foreword by David Reed, Whitbread PLC; Towards an understanding of corporate communications; Audiences who - and where - are the key publics? ; Corporate identity: the role and value of corporate identity programmes; Strategy; Using the tools provided by corporate communication; Crisis communications: truth at all costs? ; The background of the communication executive; A bright future for corporate communication.